The photo does not do this taste justice! 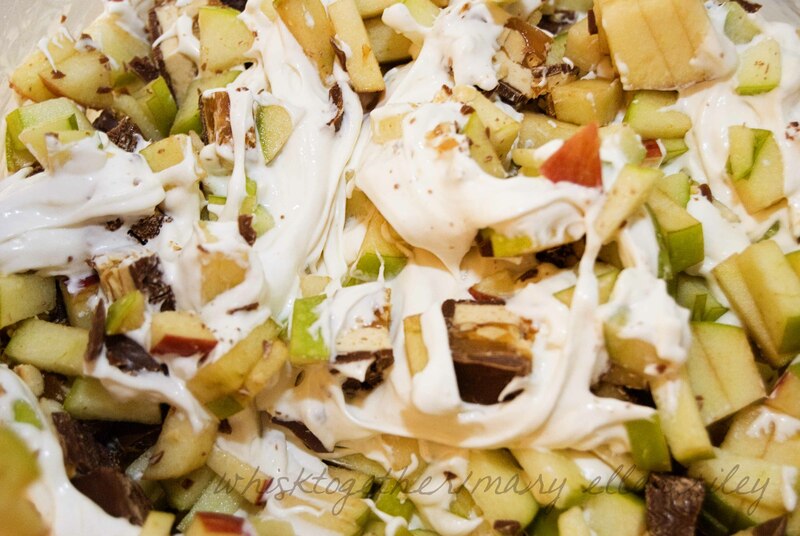 It is a blob of cream cheese, apples and snickers – but it is OH SO GOOD. Trust me. Make this today and you won’t regret it. Or at least pin this recipe for after Halloween and you have all those snickers bars laying around the house. The kids LOVED it, the adults loved it and it was devoured fast. The only kicker is that you have to consume it the day it is is made or the liquid will start to weep out into the salad. Instead, I chopped the apples and snickers and put them in separate bowls. 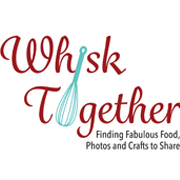 I mixed the cream cheese mixture ahead of time and kept that in another separate bowl. About 2 hours before serving, I dumped the apples and snickers into the cream cheese mixture, stirred it up and I was all done. Make sure to put some lemon juice on the apples of course so they don’t brown. Easy peasy lemon squeezey as my son would say. 1. With an electric mixer, beat the cream cheese until smooth. On low, mix in the powdered sugar and then the vanilla. Fold in the Cool Whip. 2. 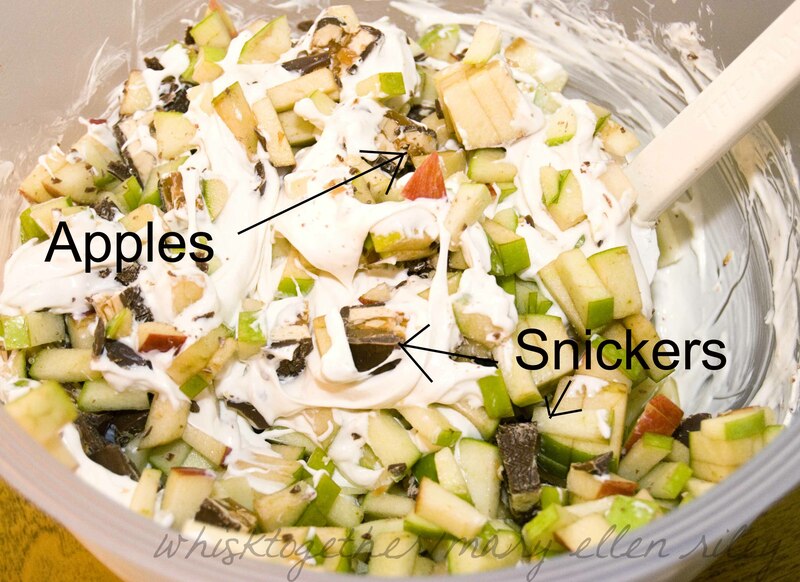 Add chopped Snickers bars and chopped apples. Fold this in. It’ll be all mixed up and no one will even know there are snickers inside until they take a bite! 3. Serve within 1 day. You can serve this immediately, or store in the fridge for a few hours. It is still Yummy the next day, however, it is just a little liquidy. holey moley! that is crazy good looking, and all the apples totally make it calorie free, really, it’s a rule!